Marcie Holland smiles before the start of last weekend’s River Valley 5k Rave in Grand Bay-Westfield. Editor’s note: Just a year ago, Marcie Holland’s Marathon By The Sea experience ignited her passion for endurance sport. Funny thing is, she wasn’t running last year – but watching her sister Shelley Doucet. Yet the emotions associated with MBTS, the sight of her sibling crossing the finish line and witnessing tears of joy and celebrations of so many others made an impact on Marcie that lasted well after the event wrapped up. It fueled a motivation to get active, deal with nagging fatigue and sparked a desire even she could not have imagined. Through it all, she credits her sister Shelley for opening her eyes and in some ways, saving her life. It also solidified their sibling bond stronger than ever. This year, Marcie is enjoying amazing results on the provincial racing scene and last week, she finished in the top-10 overall in the women’s event at the River Valley Rave in Grand Bay-Westfield. Her exceptional story of fighting through some early struggles to her current success follows. My sister decided to run the half marathon at Marathon by the Sea in Saint John six days before the race with her husband in August of 2013. I watched at several locations along the route as we drove from place to place. 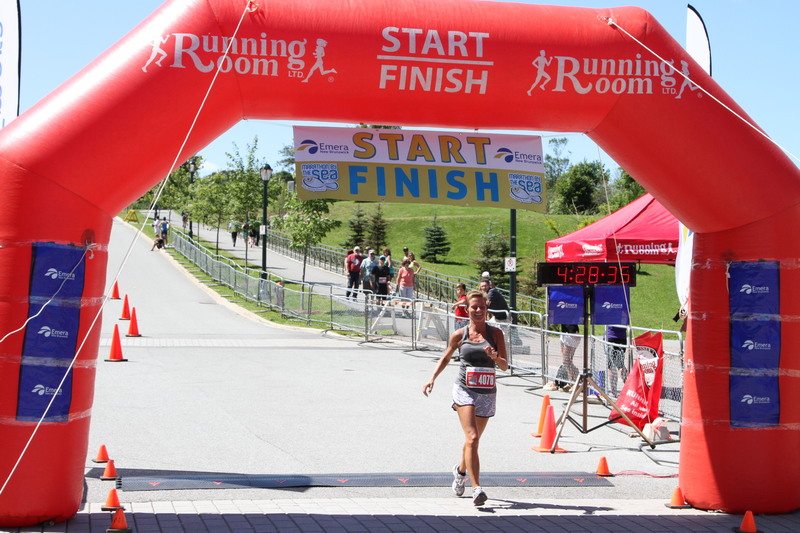 Shelley Doucet of Quispamsis has taken the provincial running scene by storm with a record-setting start to 2014. 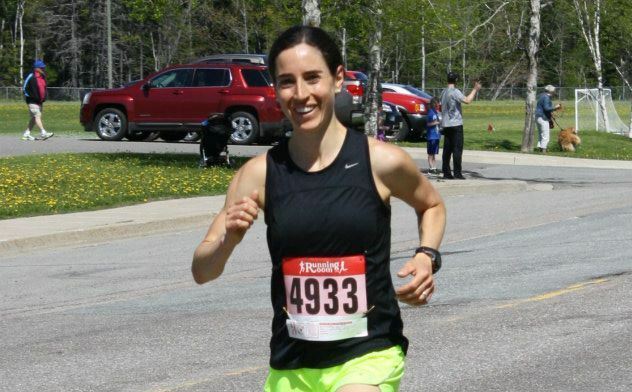 She has already qualified for the 2015 Boston Marathon and will run the full at the Marathon By The Sea this August in Saint John. Editor’s note: This time last year, Shelley Doucet of Quispamsis and her husband Evan felt they could save half the time if they took their dogs running each day instead of their normal walk. They were busy, with two young children and demanding jobs, including Shelley’s role as a professor in nursing at the University of New Brunswick. But in addition to the time saved, they rediscovered their admiration of the sport and a short time later, Shelley decided to enter Marathon By The Sea, signing up for the half marathon the day before the event. Since then, the results have been nothing short of electric, especially this year, with numerous victories in the provincial running scene including four course records since April. Last week, for example, she set a new mark at the River Valley Rave 5k, coming in under 18 minutes and last fall, she qualified for the Boston Marathon in her first marathon. In a few months, she will return to Marathon By the Sea, where this incredible string of success started last August. Toby Richardson of Fredericton, shown here in the finish area at the 2013 Marathon By The Sea in Saint John, qualified for the 2015 Boston Marathon last October in Moncton and is one of the approximately 2,100 runners expected to participate in the 2014 Scotiabank Fredericton Marathon May 11. Photo Submitted. This is the second of three stories in the Daily Gleaner (@dailygleaner) on runners who will be competing in the Fredericton Marathon next week. Toby outlines her courageous fight that involved her family, friends but more importantly, her own commitment. Among the rewards along this 4.5 year period of recovery was qualifying for the 2015 Boston Marathon. But the personal rewards along her journey are much more significant. For over two decades, Toby Richardson relied on food and alcohol as her crutches to get through life. 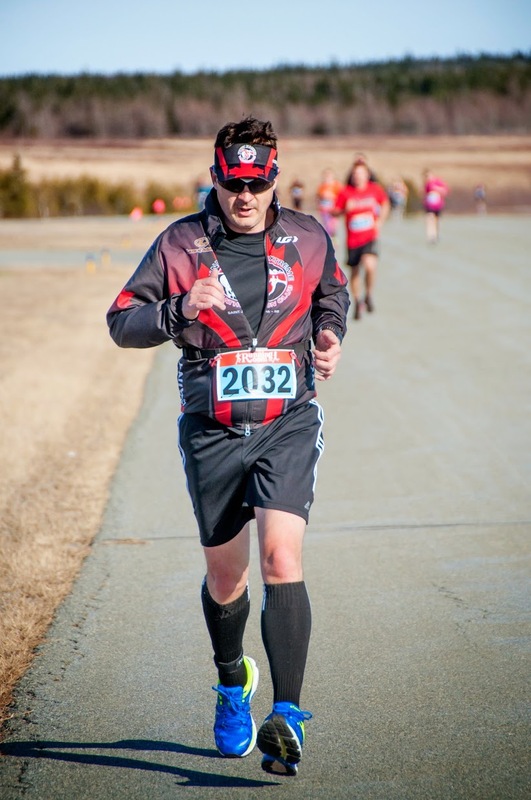 All that changed four and half years ago when the Fredericton resident rediscovered a passion for running and began rebuilding, aiming toward a better way of life. 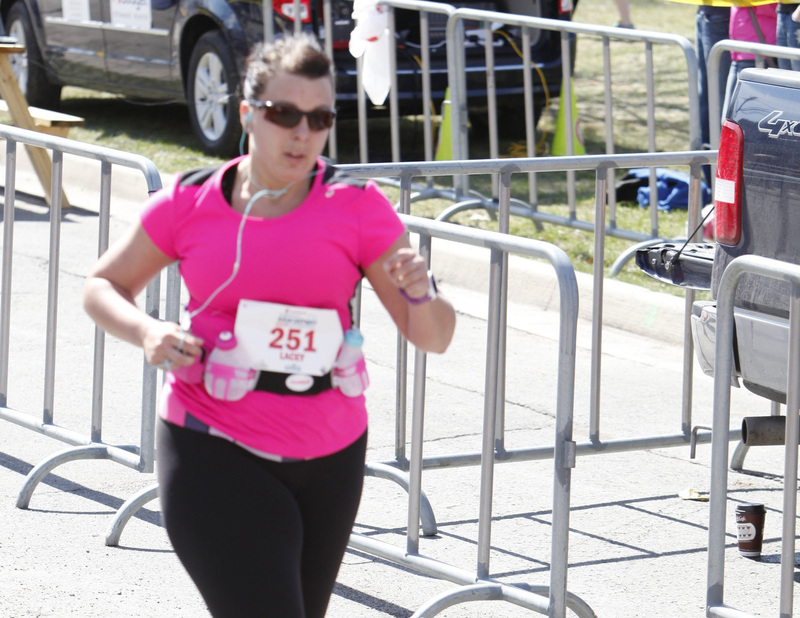 Richardson, 45, will be one of more than 250 marathon runners at next week’s Scotiabank Fredericton Marathon, but for her, this run is just another step in a journey that is much longer than the 42.2 km route and much more important. Richardson’s story, however, is not about the pursuit of fast times and finish lines but an inspirational personal recovery that’s taken courage, support and dedication. It’s one that won’t end with the 36th annual edition of the popular race. One of the key steps in her recovery was starting to run again 10 years after completing a half marathon that admittedly didn’t go that well. Now, she’s got two marathons under her belt and has even qualified for the 2015 Boston Marathon. In addition to relying on running to help in her recovery, Richardson enlisted the help of her personal network, those whose love and support were critical, serving as another collective crutch in her journey. Specifically, she cites her parents, David and Glenna Richardson, her boyfriend Jamie Pickard and her girlfriends Maryanne Davies, Tina Waterhouse-Campbell and Lisa Stafford. With them and their unwavering support, guidance and just being there, they’ve helped during the most difficult moments in her recovery and as well as being on hand to celebrate the special moments. They will be there with her next Sunday – if not physically, then in spirit – saluting their daughter, friend and partner and she races with approximately 2,100 others in all of the distances through the streets and trails of New Brunswick’s Capital City. “My support team is extensive both on the trail and off,” Toby said. “There are days I have difficulty connecting the dots or even tying my shoe laces. Living with G.A.D. (Generalized Anxiety Disorder) would be impossible without guidance from the mental health professionals at Victoria Health Center. My girlfriends have seen me at my worst and continue to love me when I can’t love myself. As for running, Richardson competed and completed her first marathon last August, in 23C conditions at the Marathon By The Sea, where she clocked a 4:27.09 time. “I was so proud, never imagining I’d ever make the finish line,” she said. It spurred her on but even the most optimistic people could not have imagined what happened next, when at the Legs for Literacy Marathon in October, she shaved more than 35 minutes off her time in 10C conditions and qualified for the 2015 Boston Marathon in 3:51.37. 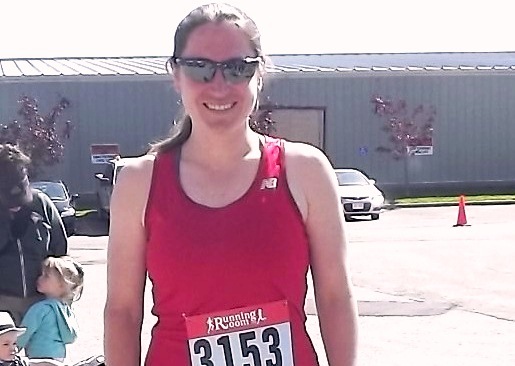 Richardson was born in Fredericton and for the past 14 years, has called Marysville home, so she is well aware of the city’s trail system that makes up a large portion of the Fredericton Marathon’s double-loop course. This upcoming event, for her, is part of prep work for Boston next April and she is aiming to escape next weekend free of injury. A new personal best won’t hurt either. However, in the bigger picture, it’s 42.2 km further along in her emotional and important journey.